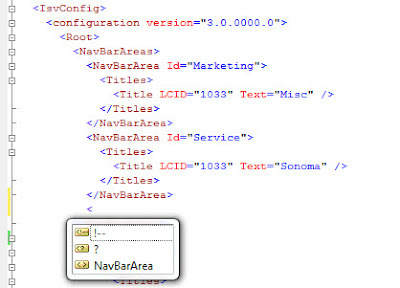 In CRM we needs to edit Sitemap & ISV.config files most often. To edit these files easily, visual studio providing intelligence for these XML files. Download the CRM 4.0 SDK. The files you will need are located in the schemas folder of the SDK. Open the xml(sitemap/isv.config) file in Visual Studio. Press F4 to bring up the properties dialog. Now, when you start to edit your file, you will see the IntelliSense for your nodes and any malformed nodes will be highlighted.